Herpes angina, commonly called herpangina, is a contagious illness often seen in children caused by an enterovirus. Coxsackie group A virus is the most common cause. Ulcers in the mouth and throat are the main cause of pain children may experience. Seeking medical treatment can help determine how to alleviate the pain brought on by herpes angina. If you peer into the throat with a flashlight and see ulcers that are white or gray in the middle with a red outer ring you are most likely seeing symptoms of herpes angina. The ulcers are usually 2 to 4 mm in size, and the child may have as many as six of them in the back of the mouth and on the soft palate (the back of the roof of the mouth). Taking acetaminophen (Tylenol) or ibuprofen (Motrin) by mouth for fever and discomfort. Increasing fluid intake, especially cold milk products. Gargle with cool water or try eating popsicles. Avoid hot beverages and citrus fruits. Eating a non-irritating diet. (Cold milk products, including ice cream, are often the best choices during herpangina infection. Fruit juices are too acidic and tend to irritate the mouth sores.) Avoid spicy, fried, or hot foods. Using topical anesthetics for the mouth. Although herpangina usually goes away on its own, you should seek medical help if the sores, fever, or sore throat persist for more than 5 days or are extremely severe. If kids refuse to eat or drink because they are in so much pain, seek medical attention right way. Caring medical professionals at your local FastMed can determine the right treatment for painful herpes angina symptoms. 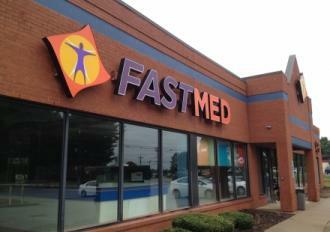 With convenient hours, FastMed is open when you need us most.